ICanFixUpMyHome: Bringing International Décor to Your Home - Decorate your interior in the style of Spain, Italy, Japan, or China. Design styles are diverse and they present hundreds of opportunities for decorating your home in a unique and creative manner, based on your personal tastes and design preferences. You can choose the design style based on era, such as contemporary or vintage; by the look, such as classic or modern; or by the locale, such as Old English or international. Bringing international décor to your home does not have to cost a small fortune, but be prepared to do your homework and make a few big purchases on occasion, depending on what country you are hoping to mimic. The Hispanic culture is one of the easiest to choose, simply because there are so many beautiful ways to bring the look of Spain into your American home. You can keep it simple with wrought iron pieces and art-deco styles, or go all out and add vibrant colors, beautiful classic wood flooring, stucco, religious symbolisms and open spacious designs. Spanish designs are about beauty, and some of the most beautiful furniture designs come from this international location. South American décor is very similar, and Italian décor is only different in a few minor ways. Color choices: Rich, vibrant reds, greens, yellows, and blues, earthy browns, deep classic black and white, and elegant off-white. Use the more vibrant shades only as accent colors in the bedroom to avoid overwhelming the room in passion and energy. Fabrics: Flowing cotton and sheer fabric choices. Ole! Similar to Spain, Italian designs have a definite Mediterranean look to them that gets your blood flowing. They add passion and romance to the home, and the classic look is perfect for a bedroom or the entire home. You can add interesting accessories to an Italian theme, such as wine grapes, wine bottles, grapevines, and similar ideas that are well known in Italy. Also, check out items that deal with specific parts of Italy, such as Tuscany or Capri. Wrought iron, rustic wood finishes, stucco or Rococo art and Venetian art are all possibilities depending on the look that you desire. Color choices: Roughly the same as Spain but add deep wine purples for accessories and accent colors. It is easy to incorporate Italy in any room, but especially so in the dining room and kitchen areas. Fabrics: See Spains fabric selections. Oriental cultures are very refined and elegant, such as Chinese or Japanese, and the architectural designs are undoubtedly among the most beautiful in the entire world. 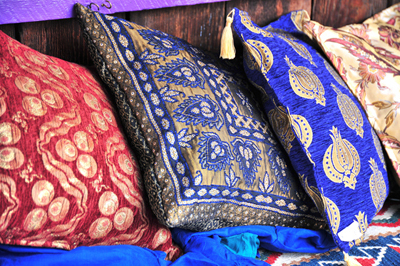 It makes sense that you need something extra special to use the Orient for a theme, such as red silk, gold thread, crystal accent pieces, and faux gemstone looks. You can also pull some of the wildlife into the décor, such as the panda, or utilize ideas such as the Chinese calendar for your decorating inspiration. Color choices: Feng shui decorating styles, with a focus on vibrant red, gold, traditional white, and basic black in many cases. Fabrics: Silk, satin, and similar choices that are very refined and sophisticated. Alyssa Davis, is a design specialist and writer at Metal-Wall-Art.com, and she offers many suggestions and unique ideas for designing with Tuscan metal art and door toppers metal art. Article © 2011 Alyssa Davis All rights reserved.